As many as 77.5 per cent voters in Ludhiana district cast their votes today in a free and independent environment. Except for minor hiccups and a few incidents of brawls, no major poll violation or violence was reported from the district on the polling day. People in large numbers, including women, senior citizens and first-time voters, went to exercise their right of franchise at respective polling stations today. Sanjay Kapoor, BJP leader and personal assistant (PA) of BJP candidate from the Ludhiana Central constituency Satpal Gosain, and his close aides were allegedly thrashed by a group of persons in the Field Gunj area here today. Sanjay was attacked by the mob in the morning when he was visiting the Field Gunj area to check the poll progress. Though the police and paramilitary forces deployed for the assembly elections here did a commendable job to ensure by and large peaceful polling, in some parts of the city, local residents, shopkeepers and vendors faced a curfew-like situation created by certain overenthusiastic police personnel. 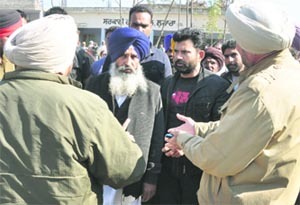 Tension prevailed at a polling station in the Lohara area after independent candidate Balwinder Bains, Congress candidate Ashok Prashar Pappi and SAD candidate Hakam Singh Gyaspura, along with their supporters, gathered at a polling booth and started levelling allegations and counter-allegations against one other for influencing voters. Election din cast its shadow on the martyrdom day of father of the nation Mohan Das Karamchand Gandhi as no politician or anyone from the Jalandhar administration visited the Gandhi Memorial in Phillaur to pay tributes today. As the entire country is observing a dry day, the boozers could easily be spotted at the Gandhi Memorial. A person named Sukhwinder Singh Talwandi alleged that he was not handed over “form” 17A, which is related to “right not to vote” at a polling station in the Atam Nagar constituency. He said the election staff on duty told him to come after two hours if he wanted not to cast his vote. 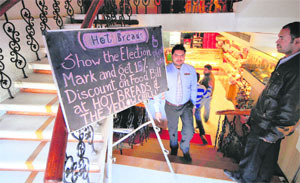 Encouraging voters to use their right to franchise, the owners of some of the stores in the city came up with attractive ideas. Customers were given the opportunity to avail themselves of discounts after showing their voting ink mark. Despite sporadic allegations of mild rigging and violence by supporters of the SAD and Congress during the Assembly elections in Sangrur and Ludhiana districts, polling passed off peacefully with no untoward incident reported till the conclusion of polling. Around 72 per cent of total 1.58 lakh voters in the Jagraon Assembly constituency cast their ballots today. With this, the fate of four candidates, including Isher Singh Meharban of the Congress, SR Kaler of the SAD-BJP alliance, Major Singh of the Sanjha Morcha and an Independent and Congress rebel, Rajeshinder Singh Sidhu, was sealed in the electronic voting machines. The Central Board of Secondary Education (CBSE) in its norms for affiliation from the board states that schools should pay salaries at par with what is paid to teachers in government schools. But these norms in most of the CBSE schools in the city are not abided by. Living away from their homes, the migrant population in the city today got an opportunity to cast their right to vote and give their say in forming the next government. While some have gone back home to cast their vote, others stayed back and cast their vote in the city, which offer them employment. A fair-like environment was witnessed at different polling stations in the Ludhiana West constituency, where a large number of voters turned up throughout the day today to cast their vote. Inmates of the Mahavir Kushat Ashram located on the southern bypass along the Sidhwan Canal near Doraha cast their vote with a hope that the new government may think of their rehabilitation in a better way. The Atam Nagar constituency, which witnessed a triangular contest, remained peaceful throughout the day. Before the polling, the Election Commission had kept a close vigil on this constituency as two arch rivals, Hira Singh Gabria (SAD) and Simarjit Singh Bains (Independent and Akali rebel) were in the fray. Malkit Singh Birmi, a two-time Cabinet minister, was the Congress candidate from this constituency. 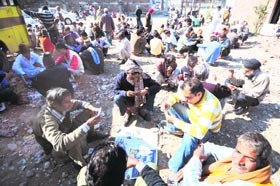 It’s not only the candidates from the 14 Assembly constituencies of Ludhiana who had been waiting for the polling day. The city also had some keen voters, who despite their age and physical disabilities went ahead to cast their vote. The quantum of excitement was high among the first-time voters who were seen casting their valuable vote. 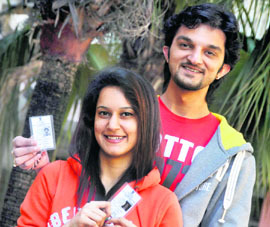 New Year today became all the more special for the first-time voters of the city. Youngsters feel the power to press the button of the EVM has metamorphosed them from being a carefree to be a responsible citizen. Except some minor scuffle, the entire election process completed peacefully in the Khanna and Samrala constituencies today. Long queues were witnessed at several polling booths in villages and cities. High- Daram was witnessed at Sukhdev Hall in PAU, when the government employees who were deployed in reserve quota for election duty went on a rampage and complained that the administration employees denied giving them money for attending poll duty. Several formalities and verifications have to be done to make a new vote, but when it comes to cancel a vote, it is, too, easy for election staff to cancel it without any verification. Satnam Singh, a resident of ward No. 61, Dugri, and a candidate of the Congress in municipal council elections, cast votes in the Shiromani Gurdwara Parbandhak Committee (SGPC) elections. But in the state Assembly elections, name of Satnam Singh and his wife are missing from the voters’ list. When he enquired from the authorities, they told them that their votes were cancelled. “Now that we have observed the entire scene with our own eyes, there is no need for us, at least to cram the paragraph on ‘a scene at a polling booth,’ especially marked important, by our teacher, for the coming annual examinations,” expressed Tamanna of class VII of Doraha Public School. Although employees of the health department were not deputed on polling stations, they remained alert throughout the day in their respective dispensaries and hospitals. Workers of the Shiromani Akali Dal (SAD) alleged that supporters of the Congress abused them at a polling booth here today. The Congress leaders and police, on the other hand, seemed to be in a denial mode. The Central Board of Secondary Education (CBSE) has introduced a new programme “Environmental advice” for school students. The move has been taken to change the mindset of next generation about environment concerns. The IMA, Ludhiana, observed World Leprosy Day here today at Kushth Ashram. Doctors, including Dr DP Singh Arora, president IMA, Ludhiana, Dr Bimal Kanish and Dr Ravneet Kaur, a skin specialist, Dr Arun Gupta, Dr Suman Bali and Dr Amit Khanna went to Kushth Ashram, Islamganj, Ludhiana. Dr Bimal Kanish and Dr Ravneet Kaur examined the patients. Harbir Ayali, younger brother of Manpreet Ayali, SAD candidate from Dakha, and his close aides were booked by the Jodha police for detaining a Congress worker and snatching voter list from the latter in Dhulkot village here today.